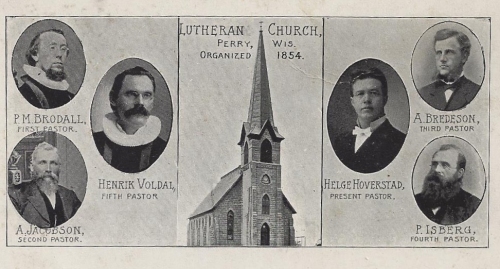 Notes: After the November 5, 1854, decision by many members of the first church in Perry to form a separate congregation that followed the worship of the State Church of Norway the new congregation had to organize. Because until 1952 only the men of the congregation could vote on matters they elected three trustees. Services were held at the school house. In February of 1855 a site was selected for a new church building. The congregation made plans to erect a 46’x65’ stone building and its foundation was laid in 1856. The first service was held on Christmas Day in 1958. This building was hit by a cyclone in May of 1878 and had to be extensively repaired, and a wooden steeple was added. In August of 1888 lightening struck the wooden steeple of the Perry Church. When it was struck again in August of 1903, the congregation rebuilt the steeple in limestone and copper. Just prior to 1915 and the church’s 60th anniversary the building was enlarged, remodeled and refurbished. 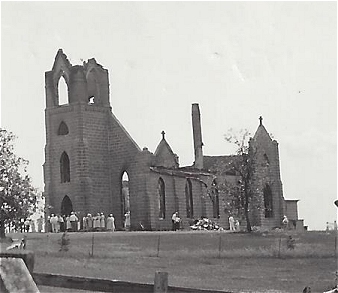 During a fierce thunderstorm in July 1935, the church was again struck by lightning and burned to its four walls. The building was reconstructed and was dedicated in 1937, this time minus its soaring steeple. The lower tower on the present church was completed in 1954. 1914. Erick Erickson chief mason. Stone from Erickson's farm.